Dhaka was the first stop on the ASTC-ITU Development Camp’s schedule. The project is a combination of a talent identification program & sustainable coaching development. A total of 18 coaches and 28 athletes, aged between 14 - 23 years old, from Bangladesh attended the Development camp. The coaches in attendance had diverse sports back ground such as athletics, swimming, and cycling, with the athletes selected from National Sports School swimming team. The sports school has good training facilities and talented athletes selected around this country. Participating coaches and athletes showed great interest in the sport and were eager to learn the basic training skills and drills in the class room and practical sessions. “The right first step for our sport development is very important. This camp helped new emerging countries start with a solid base. They can minimize the trials and errors that advanced countries went through at their beginning stage. Personally it served as a good opportunity to learn the new federations’ needs,” said Ki, Woo Kyong, ASTC Sport Development Coordinator. “The Bangladesh delegation has high hopes for including triathlon as part of their national development program. ASTC & ITU’s technical camp allow athletes to improve their technique and skills. 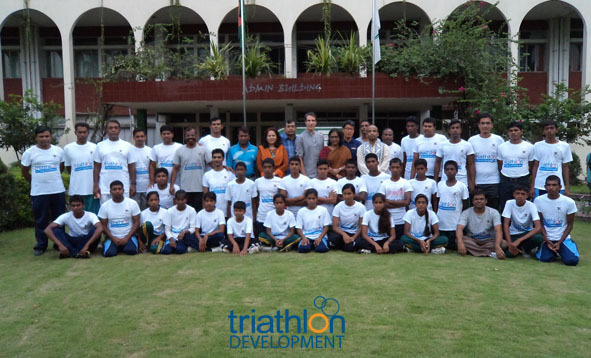 The next steps for Bangladesh are to have triathlon in their national talent program and to fortify continuing education for their coaches. This will ultimately lead to better athletes and better governmental support,” said Luc Morin, ITU development coach and facilitator. The next ASTC-ITU Development Camp will be held in Colombo, Sri Lanka.